Ezra and Lula Ree Peterson in McKenzie Alabama. of the Church of the Living God. married Ebert Lee Powe on November 23, 1957. She was employed at Lady of our Haven of Peace where she worked as a nurse’s assistant. Later in life she used this skill and her love to provide care for many of her family members. She was the caregiver for her mother-in-law, Eliza kid; her aunt, Doll; her sister-in-law, Eve Peterson and her mother, Lula Ree Peterson. She loved her family and always made the sacrifices needed to ensure that they were taken care of in their time of need. to all she came in contact with. and attended Sunday School. She enjoyed praising the Lord! 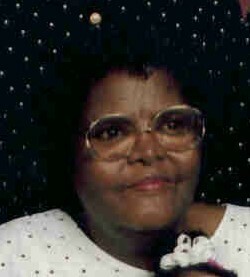 She leaves to cherish her memory: her daughter, Emmia Brown of Pensacola FL; her brother, Willie (Lola) Peterson of Molino FL; grandchildren, Levadie (Bishop Matthew) Townsend of Pensacola, FL; Joseph F. (Annie) Brown of Pace, FL; six great-grandchildren; three great-great-grandchildren and a host of niece, nephews, cousins, church family and friends. To send flowers to the family of Mamie Lou Powe, please visit our Heartfelt Sympathies Store. Mamie interment will take place at Holy Cross at 2:15. We encourage you to share any memorable photos or stories about Mamie. All tributes placed on and purchased through this memorial website will remain on in perpetuity for future generations.